It's the viral mystery that has captivated social media from Belfast to Blarney, and generated its own hashtag. Just who is Ireland's #PintBaby? Last week, a 20-year-old clip of a Guinness-guzzling toddler sitting on his mother's lap surfaced on social media. The footage was originally broadcast by Irish national broadcaster RTÉ in 1997. RTÉ's Cian McCormack uploaded the clip with the description: "You won't see this on TV nowadays." 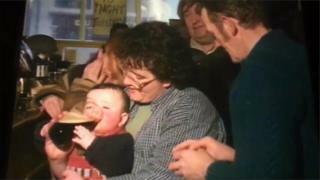 It was filmed during a television report on the scarcity of single women in County Clare, when the camera inadvertently caught the thirsty baby with two hands firmly around a pint of stout. Since then Ireland has been caught in a similarly tight grip, and Pintbaby mania was born. Satirical comedy duo The Rubberbandits posted a clip on Facebook which attracted almost 800,000 views and over 6,000 likes. "90s Ireland. When a child is just swigging a pint and it's just an aside, it's not even the focus of the story. Just something that's happening in the pub," they wrote. Now, Cian McCormack has gone one better and tracked down Pintbaby - or Stephen Barron, as he is better known - in Prosperous, County Kildare. The 20-year-old's mother Caroline told RTÉ that they ended up in front of the cameras after going into Daly's Pub in Ennistymon, County Clare. "We were there and there was great fun and atmosphere and craic going on and Stephen was sitting on my knee and took a shine to a pint of Guinness and had a drop out of it," she recalled. While the conversation around the Pintbaby phenomenon has largely been light-hearted, some have criticised this attitude. Jennifer Whitmore, a councillor in County Wicklow, tweeted that the Pintbaby "national icon" status was "evidence that Ireland has an unhealthy relationship" with alcohol. However, Caroline said: "There's plenty of parents even to this day that will dip a doody [dummy] into a pint of Guinness." "It wasn't an everyday occurrence or a weekly occurrence or anything, it was just the situation we were in at the time and he had a drop and a camera happened to be there at the time," she said. She added that the reaction had been "very good, a lot of people have been commenting: 'Ah sure we were all reared like that.' And there have been a lot of positive comments." As for Stephen, he told RTÉ he was working part-time and that he had graduated from the occasional sup of the black stuff to blacksmithing. As for being called PintBaby, he said: "I don't really mind, but I'd rather be called Stephen now."